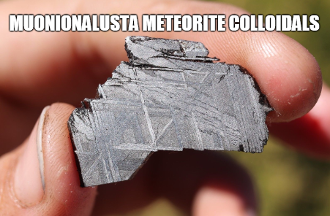 The Muonionalusta is a meteorite classified as fine octahedrite, type IVA (Of) which impacted in northern Scandinavia, west of the border between Swedenand Finland, about one million years BCE. The meteorite was first described in 1910 by Professor A. G. Högbom, who named it "Muonionalusta", after a nearby place on the Muonio River. It was studied in 1948 by Professor Nils Göran David Malmqvist. 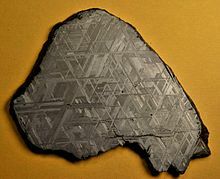 The Muonionalusta, probably the oldest known meteorite (4.5653 billion years),marks the first occurrence of stishovite in an iron meteorite. The name Muonionalusta is difficult for some to pronounce: ['mu-o-ni-o-na-lu-sta] or /MOO-oh-ne-oh-nah-loo-stah/ from the Muonio River (muoni- apparently means ‘food’); -(o)n- could be a needed connective; the final element alustameans ‘base, foundation, a stand, mat, tray’, thus probably ‘Munio (River) base’. Studies have shown it to be the oldest discovered meteorite impacting the Earth during the Quaternary Period, about one million years ago. It is quite clearly part of the iron core or mantle of a planetoid, which shattered into many pieces upon its fall on our planet. Since landing on Earth the meteorite has experienced four ice ages. It was unearthed from a glacial moraine in the northern tundra. It has a strongly weathered surface covered with cemented faceted pebbles. Full slice (across 9.6 cm) of the Muonionalusta, showing the Widmanstätten pattern.